Keeping food on an open counter that is both pleasing to the eye, easily accessible to customers, and at a temperature below 41 degrees can be a difficult challenge. 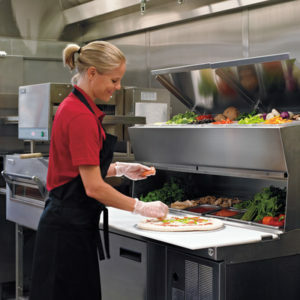 There are many types of cold pans, drop-ins, and forced air units that can be used for salad bar type operations. Choosing the right piece of equipment – AND – knowing how it is used is critical to providing a healthy and attractive offering to your customers. Every restaurant manager knows that sinking feeling when the health department shows up unannounced. Those with a salad bar know that before the visit is over most every food item on the bar will be probed for temperature, and often there are items that exceed the 41-degree threshold. We often get the call in the hot summer months where the store is looking for emergency service to get the unit back in compliance. In many cases it is not the piece of equipment, rather the environment and operations surrounding the salad bar that is causing the problem. We all know warm air rises, and cold air drops. To maintain a temperature around food in an open environment like a salad bar you basically must trap the cold air so that it pools around the food. The best example of this is walking into the freezer section of the grocery store. The open freezer with tall sides basically are providing a “bucket” of cold air for the food to be held. The salad bar design needs the same consideration to maintain temperatures below 41 degrees when all the air around it is likely 75 to 80 degrees. Most cold pan buffet style refrigerators require the food pans to be recessed up to 2” below the top surface to maintain temperatures. Where you start running into trouble maintaining temperature is with moving air around the bar and/or heat sources around the bar. Moving air occurs from AC vents and open doors. Heat sources can be from the lighting used to illuminate the food, or from the cabinet below where the compressor is generally located. This picture taken with an infrared camera shows a salad bar unit sitting on a cabinet that is more than 117 degrees. In this case hot air is sitting below the salad bar and naturally rises all around the bar making it very difficult to keep the food below 41 degrees. The cabinet needs to be vented such that the hot air being produced by the compressor is directed away from the cold food storage area, additionally refrigeration equipment works best when the ambient temperatures is 85 degrees or less. LED lights should be used in place of incandescent lights whenever possible as another heat source. Consider using glass panels in the cabinet design where possible to help reduce air movement. Other common problems are overfilling the food containers and not refrigerating the food prior to placing it on the salad bar. Most salad bar equipment is designed to maintain temperatures, not to be used to bring the temperature down. Consideration needs to be given in transporting the food to the bar. Food should be placed in the salad bar at about 35 degrees. 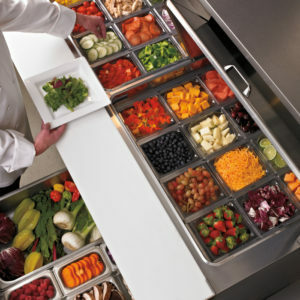 Delfield makes four types of Buffet style refrigerated equipment for salad bar application. Cold pan drop-ins, forced air cold pans, frost tops, and the patented LiquiTec® technology. Give us a call and let us help you design the best salad bar for your application that is both attractive and will also give years of trouble-free performance. For more information, contact your local Delfield brand champion today!